The Atacama Large Millimeter/submillimeter Array (ALMA) has tuned in another new channel for signals from space. Using its highest frequency receivers yet, researchers obtained 695 radio signatures for various molecules, including simple sugar, in the direction of a massive star forming region. These first scientific results from the ALMA Band 10 receivers developed in Japan ensure a promising future for high frequency observations. Similar to how different radio stations on Earth broadcast different information, the various frequencies of radio waves coming from space carry different information about the environment and chemical composition at their source. ALMA's Band 10 (787 to 950 GHz) receivers are its highest frequency band yet. It has been a difficult frequency band to observe, not just for ALMA, but for other ground-based radio telescopes as well. Brett McGuire, a chemist at the National Radio Astronomy Observatory in Charlottesville, Virginia, and his team observed NGC 6634I, a nursery cloud of massive stars, using the Japanese Band 10 receivers. NGC 6334I is part of the Cat's Paw Nebula located 4,300 light-years away from Earth. NGC 6334I has been previously observed at this frequency by the European Space Agency's Herschel Space Observatory. But whereas Herschel detected 65 molecular emission lines, ALMA detected 695. The molecules detected in the direction of NGC 6334I include methanol, ethanol, methylamine, and glycolaldehyde, the simplest sugar-related molecule. Glycolaldehyde has previously been discovered at other places in space, but the clarity of the ALMA detection raises expectations that observations using the Band 10 receivers will provide new insight into the distribution of these and other molecules. "It is with much pleasure that we see the first scientific result from the ALMA Band 10 receiver," said Yoshinori Uzawa, the Director of the NAOJ Advanced Technology Center. He is an engineering researcher specializing in superconducting devices and led the Band 10 receiver development. "I'd like to express my appreciation to all, and I am looking forward to seeing yet more new insights into the Universe." These results appeared as B. A. McGuire et al. 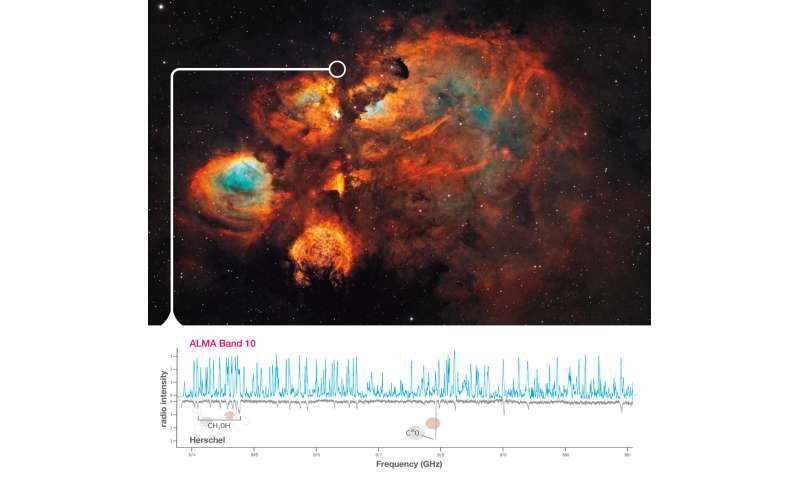 "First Results of an ALMA Band 10 Spectral Line Survey of NGC 6334I: Detections of Glycolaldehyde (HC(O)CH2OH) and a New Compact Bipolar Outflow in HDO and CS" in Astrophysical Journal Letters in August 2018. Question: When complex molecules are detected, the press seems to yell, "SUGAR IN SPACE!!!". As a lay-person, I don't have a ready rejoinder to that, like, 'dude, it ain't a some giant alien sugar bowl, it's byproducts of.... ' .... WHAT? I don't know how this works. CAN SOMEONE, please, explain how these complex molecules can form in a near vacuum of dust clouds? Seems to me, you'd need planet-full of crap like this and then blow it up so you could get signatures of it being in the dust shining from a nebula. Is the planet necessary? Seems like you'd need a soup vs. a gas-cloud... Has anyone replicated building complex molecular chains in a near-vacuum, high-radiation environment? CAN SOMEONE, please, explain how these complex molecules can form in a near vacuum of dust clouds? Most of the chemical reactions occur on the surface of dust grains. You will probably find the answers to your questions in the introduction. Good to see these frequency ranges coming on line at ALMA. More good stuff is sure to follow.